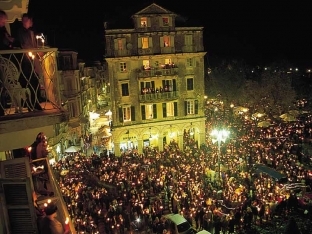 Easter in Corfu is a unique experience and it is completely different from anywhere else in Greece. If you happen to be on Corfu during the Easter period be assured that you will experience the most amazing Easter of your lives! Good Friday is the day of the Epitaphios which is the funeral of Christ. All over the island as, every church brings out its own funeral bier and parades it around the parish. In Corfu however; the attendant philharmonic orchestras and choirs and the presence of thousands of Corfiot’s, as well as foreign visitors, give another dimension to the gravity of the occasion. The bands of the philharmonic orchestras are separated into squads. They accompany the epitaphs of the town's churches. Late in the afternoon the squads come together to form the whole band in order to accompany the epitaph of the metropolitan church, St. Spiridon. On Holy Saturday at 11 a.m. the First Resurrection and the "Pot Throwing" custom take place. The philharmonic orchestras and the choirs of the town take part in the litany of the epitaph/funeral biers’ of the town’s patron saint, St. Spyridon, in procession with the Saint's relics. The litany is followed by the celebration of the "Early Resurrection" where balconies in the old town are decked in bright red pieces of cloth. Then the Corfiot’s throw down large clay pots (the co-called botides) that are full of water to smash on the street pavements. 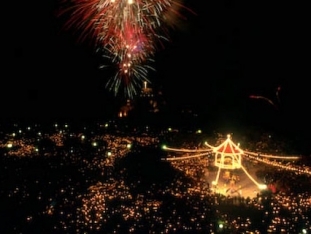 This is enacted in anticipation of the Resurrection of Jesus which is to be celebrated that same night when all people gather at the Esplanade to celebrate the Resurrection and enjoy the fireworks! From then on the whole island parties till late in the morning! People celebrate Ester Sunday with their families eating “lamb from the spear” and smashing red eggs; (they hold one egg and the smash with the egg of the other, if your egg doesn’t break, you win!). 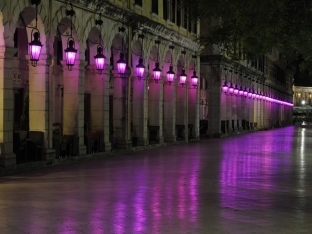 We bet that if you experience Easter In Corfu you will come back again and again!!!! So, Christos Anesti And Happy Easter!!!! !